A Hot Cup of Joey: Where in the World is Captain Obvious? Where in the World is Captain Obvious? Much like Carmen San Diego in her heyday, Captain Obvious is traversing the country. Although instead of doing so to solve mysteries, he's entering the Presidential Race. And he's wearing shorts, running shoes and knee socks, because a giant red overcoat is no good for athletics. It's a bit perplexing why nobody else is running with the Cap'n...after all, this is supposed to be a Presidential Race, right? No matter. 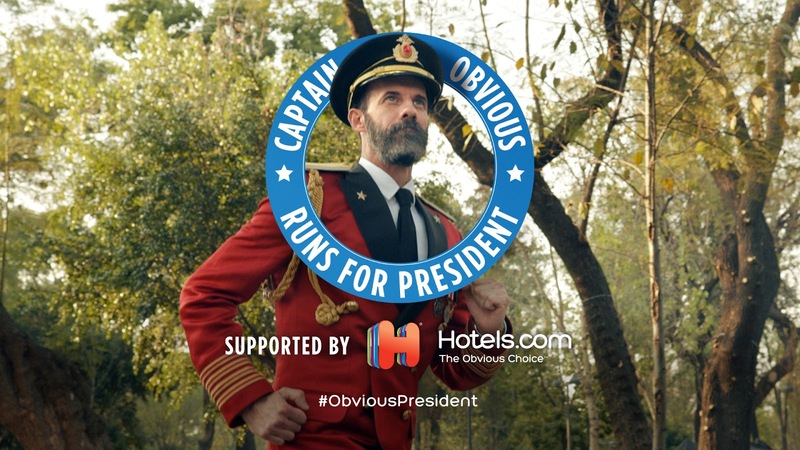 Captain Obvious is doing enough running for all of us, and when he's not getting his jog on, he's staying at accommodations that he finds through Hotels.com. Check out the link above to see where Captain Obvious is headed to next, and if he's made it to your state already. Even better, get involved yourself! There are a ton of fun Captain Obvious gifs and reactions to play around with, so go wild. They're perfect for showing off your emotions, especially if you can't quite get your face to do what your mind is thinking. You can play along on Twitter, too, using the Cap'n's Twitter page and the hashtag #ObviousPresident. Also, be sure to vote in any primaries or elections headed to a state near you. Captain Obvious will be anxiously awaiting the results.